Dame Agatha Christie was born in nearby Torquay, and her thrillers are often performed at the nearby Paignton Theatre. Greenway was her holiday home, tucked down a warren of narrow high-sided Devon lanes and overlooking the scenic Dart estuary. The house was probably built for the merchant adventurer Roope Harris Roope around 1790. The square stuccoed three-storey building has a hipped roof and two single storey loggias on either side. the gardens were immediately opened to the public. The gardeners work hard to make it appear to be a natural wilderness garden with woodland walks, wild flowers and rare plantings. The specimen trees in the dense jungle have been enjoying the fresh sea air for over 200 years. There is also a restored vinery, fig trees and old cork trees. One unexpected treasure in the gardens is the Victorian outdoor toilet. The Grade 2 listed Georgian house required £5.4 million of work to restore it to the 1950s family home which Dame Agatha described as the "loveliest place in the world". After generous donations, grants and years of work it was opened to the public in 2009. 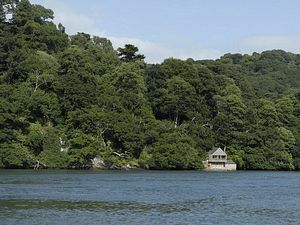 Access to the property is difficult by car so the National Trust encourages visitors to arrive by bicycle, on foot or by ferry from Dartmouth, Torquay or Brixham direct to Greenway Quay. Visitor numbers are also controlled as tickets must be pre-booked. 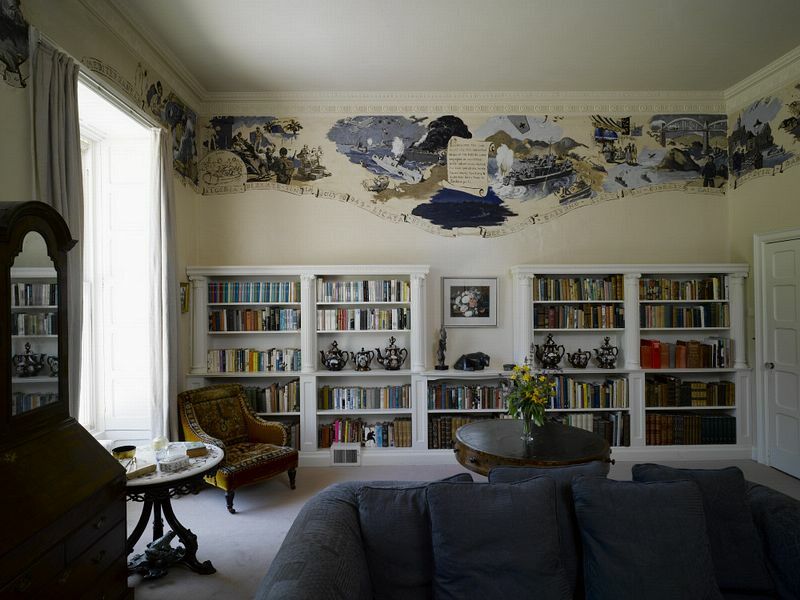 The effort is rewarded with a wonderful opportunity to see this family home as it was -library and writing desk in situ along with many collectibles including Tunbridgeware, Dartington glass, silver, archaeological treasures, dolls and botanical china. Personal family treasures and memorabilia make this a fitting shrine to the "Queen of Crime". room is where Dame Agatha would read her manuscripts to the family who had to guess "whodunit" and the books were then published in time for Christmas. Her favourite armchair remains by the fireplace and the grand piano sits close by. In the library, which has copies of all her books, is her original writing desk. During the Second World War, Greenway was used for the preparations of D-Day and a frieze was painted around the ceiling by Lt Marshal Lee depicting the scenario in a precious historical record of events. 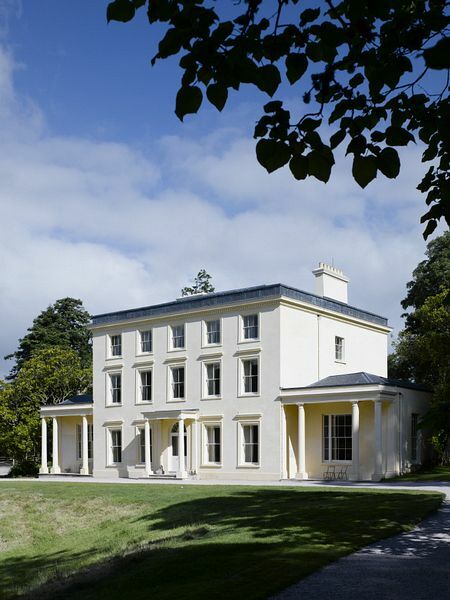 After exploring the house and gardens, Greenway's location lends itself perfectly to a picnic on the cliff top surrounded by beautiful South Hams views. Alternatively, enjoy a two-course lunch in the kitchens at Greenway which showcases the area's local produce. Enjoy a Devon clotted cream tea in the genteel surroundings of the cafe or in the converted tack room beneath the bell tower and clock built in the 1850s. Visitors will certainly not leave Greenway hungry! Down at estuary level, boathouses and the old bathing room can still be seen. At high tide seawater fills the modest bathing room. For those who want to linger in this wonderful retreat for more than a few hours, the second floor of the home is available as a holiday home. Catch a ferry from Dartmouth (use Dartmouth park and ride only), Totnes (tidal, Steamer Quay) Brixham and Torquay. Contact Greenway Ferry service on 0845 489 0418 for all information (individuals and groups), or visit the ticket office in Dartmouth opposite National Trust shop. Please allow at least 6 hours parking, from whichever destination you travel. Please note there is a steep uphill 800-yd walk from Greenway Quay to visitor reception. Limited booked parking only, early sell-outs possible, especially on Wednesdays and in the school holidays (book at least three days in advance on 01803 842382. Unbooked cars will be turned away. No parking on Greenway Road or in Galmpton village. Groups by road: midi-coaches only, limited to one per day (booked only). Walk the Dart Valley Trail from Kingswear or Dartmouth. Greenway walk from Brixham.